Deciding which platform to use to run a call center is key. The phones, after all, are what bring in the money in a call center. The Vicidial open source call center software is SPECIFICALLY designed for call centers. PBX phone systems, however, are more “general use”. That is they can perform many of the same call routing functions, but in a more general way. Many call center owners will try to use traditional PBX phone systems in their call centers, but often find the features limited for what they actually want to do. Arguably the largest difference between Vicidial and most PBX systems is the components required to make the call center, and the flow of the calls. PBX-based systems are more complicated because they use separate systems are are difficult to integrate with other data systems. Vicidial is designed to integrate both telephone calls and data systems together from the start. Lets take a look at each of these separately. The key thing to note here is that there is a MINIMAL level of integration by design (as shown in the figure below). Inbound calls will allow the PBX to ring the phones separately and, in most cases, requires the agent to manually look up a phone number. Or on outbound calls, require the agent to look up a number to be dialed and dial the numbers on the phone manually (or possibly use a click-to-dial software) before connecting the call. Suffice to say there is a lot of MANUAL work to be done by the agents with the separated components in a PBX-based call center. Additionally, the primary interface to the phone system for the agent is the phone. Another big difference between PBX-based call centers and Vicidial-based call centers is the way calls are routed to agents. In PBX-based systems, often the logic is limited to simply calls coming in and ringing a group of phones in a specific pattern. Most PBX systems can apply “Weight” to individual phones (note not “people”, but “phones”) to allow specific phones to answer calls with a higher priority than others. But that’s just about where the logic stops. It’s very difficult for an inbound call to be routed with advanced logic. And with PBX systems, outbound calls are pretty much “pick up the phone and dial the number”. However, with Vicidial, a VERY large number of customizable advanced call flow functions are available for both inbound and outbound calling logic. For example, to have a call routed to a specific agent or group of agents, based on the geographic area they came from, who their “area rep” is, the call routing criteria looked up from an external source, filter out unwanted inbound calls and redirect them to another source, automatically NOT call someone based on the disposition of the last call (or route it somewhere specific). These are just some of the default logic pieces. Functions are also opened to allow custom call routing routines to be written that haven been thought of, that might be required for a specific call center. A key metric for the effectiveness and proper operation of any call center is agent performance. This metric can mean a lot of different things depending on the call center, but in a general sense, it means how effective the agent is at doing their job, i.e. 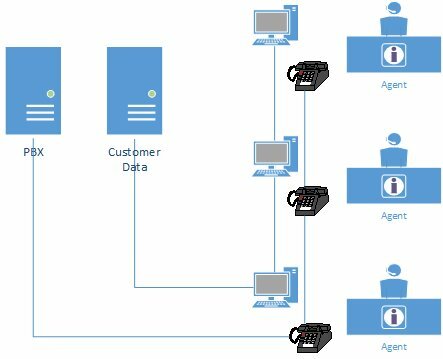 handling phone calls and the data operations that go with them. While we will get to the discussion of measuring agent performance with reporting in the next section, we would like to mention just one primary fact here: time. In a “best practices” installation, agents do not pick up a ringing “phone” – the call simply “pops” into an established web session and the agent sees a “live call” on their screen and hears a sound in their ear. All telephony actions are routed at the same time as the data and handled by the SERVER and the agent has little choice of which calls to answer. This primary benefit of this is that agents answer calls QUICKER, and operate as a TEAM to answer calls. Additionally, customers will go from waiting 15-30 seconds for someone to answer a ringing phone to 5-10 seconds maximum. Reports are extremely important to a call center. They allow call center managers to ensure the center is performing at its maximum efficiencies. One of the LARGEST strengths of Vicidial over a PBX is the sheer amount of call center data that can be gathered from the system because of its feature set and its tight integration of data and telephony. In a general sense (and depending on the make and model of PBX system) the majority of the reports gathered from PBX systems are call-based and extension-based. For example, you can see how many calls came in to a certain phone number, and to which EXTENSION they went to, and how many calls were answered within a specific amount of time. While Vicidial can also see this information, it also adds MUCH more information to this. Because dispositions are recorded at the end of each call as to the nature or result of the call, you can track how many calls of what TYPE came to a specific phone number, thus tracking sales percentages by phone number, or break out calls in even more detail. And those are just the default report CATEGORIES – there are at least 20 default reports – each of which can be automatically run and emailed each day if necessary. Additionally – because the reporting data comes from a SQL-based database, you can create custom reports or dashboards using any number of the dozens of desktop or web based reporting tools available. It is also possible to integrate dashboards from the call center data and other SQL-based CRM and ERP systems to get integrated performance metrics. This is where things get a bit more complex. It comes down to what type of call center you run as well as the size of it. Some call centers simply can’t be done with traditional PBX systems (I.E. automated dialing). For the purposes of discussion, we’ll keep it fairly simple to the “up front” costs of hardware and installation, as well as the ongoing costs of administration and maintenance. We’ll assume that fixed costs like computers and software, as well as variable costs like labor and telephony costs should be the same. In a traditional PBX systems, you would have a PBX server and individual telephone handsets for each agent (as shown in the diagram earlier in this article). If new, IP telephones are typically around $100 (on the low end) and can run up to $250 for higher end phones. But, the expense doesn’t stop there. Most call centers for efficiency’s sake, will have each agent have a headset. The unfortunate part of this is that headsets for IP telephones get expensive quickly. They cost as much, if not more, than the phones (in the range of $75-$200, depending on features of the headset). And remember, this is PER AGENT. So each agents telephone setup could run (on average) in the area of $200. In a small call center of 10 agents – that would be $2000!. That is not including the PBX server. A PBX server is typically scaled according to the number of calls and phones attached to it, but its monolithic (meaning that its ONE server). You must choose a server that will meet a call center’s needs not only now, but in foreseeable future as well, since upgrading the server means replacing it completely, which is very expensive. Finally, with respect to installation, not only does the server need to be installed, but each phone needs to have cabling to the network, which can provide challenges. In all fairness, many of the phones provide “passthrough” for the network connections for ease of installation, but its still an extra step. Additionally, best practices dictate they have their own network cables and switches. Either way, it adds extra complexity and costs. Vicidial on the other hand, works much differently. The only telephony requirement is a USB headset (quality ones can be found for <$35) and a software phone, which are freely downloadable from the Internet, be installed on the agents computer. These components working together provide the audio connection to Vicidial. Vicidial handles the call routing to the agents. Its straightforward and simple to install. The other unique thing about Vicidial’s architecture is that it can be easily scaled. You can start with a single server, and as your need for more calls and more agents grows, you can simply add more servers to handle the demand without completely reinstalling the system. Here is where the playing field between the two is more level. Administration, or more to the point, what we call “moves, adds, and changes”, is not too difficult on either platform. The major difference, however, is that in PBX systems, you administrate PHONES. 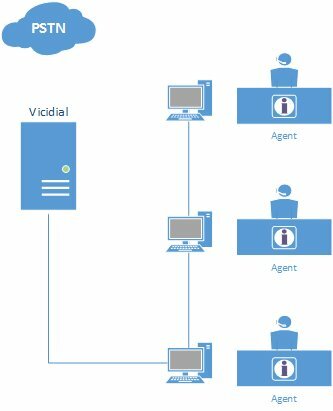 In Vicidial systems, you administrate AGENTS. You must keep in mind that calls are routed to phones in PBX systems, and agents in Vicidial. When a new person is hired, on a PBX system, you must figure out which desk/phone they are sitting at and they must stay there in order for call center statistics to be accurate. In Vicidial, on the other hand, an agent can log in at any station, but the calls and statistics will follow the user. And when new people are hired, you just keep creating users, and their statistics follow them. The other area where the systems are similar is in backups. Most IP PBX systems use FTP to backup configuration information as well as system recordings and voicemails. Vicidial is no exception. All that is required is to have an FTP server to send the backups to on a regular basis. Overall, a PBX and Vicidial are used for vastly different purposes. And while a PBX system CAN be used for a call center, Vicidial is a much more efficient and scalable choice for a call center. PBX systems are best used for managing the day-to-day telephone traffic of an office.